You might see the title of this post and think red and pink? Together? Outside of February or a Valentine’s Day card? I say absolutely! It’s a bright and fun combo that doesn’t clash, but complements each other adding more power, femininity and boldness than almost any other color couple. Go ahead, give it a whirl. Emma Stone rocks the look with a little added pizazz in her pink bottom. A classic red pencil skirt on bottom will do the trick with bright pink on top. Two classic pieces that can stand alone just fine or stand out as a pair. Keep the shoes neutral here. Or add a neutral jacket or sweater like Anh of 9to5chic. Again keeping the shoe neutral to balance all the color. Or try the combo on top and leave the bottom neutral. I love this fuffly skirt and the red clutch. If you’re still a little shy, try just a red and pink shoe. 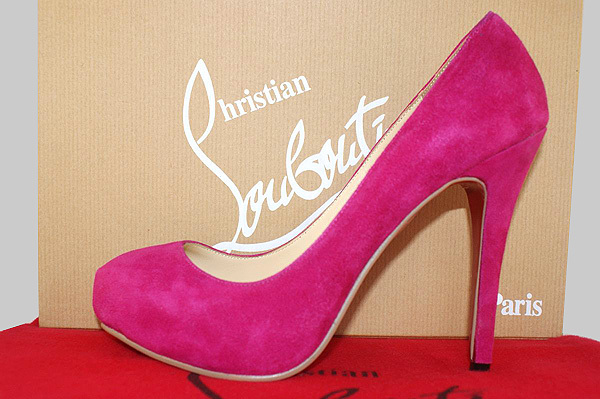 The signature red bottoms of the Christian Louboutins add just enough punch to these hot pink suede pumps. Dee-lish! I’ll take a pair of these! Or how about this? Too much? Just stick with the fashion.